An 30 Watt audio amplifier circuit with TDA2040 shown here. 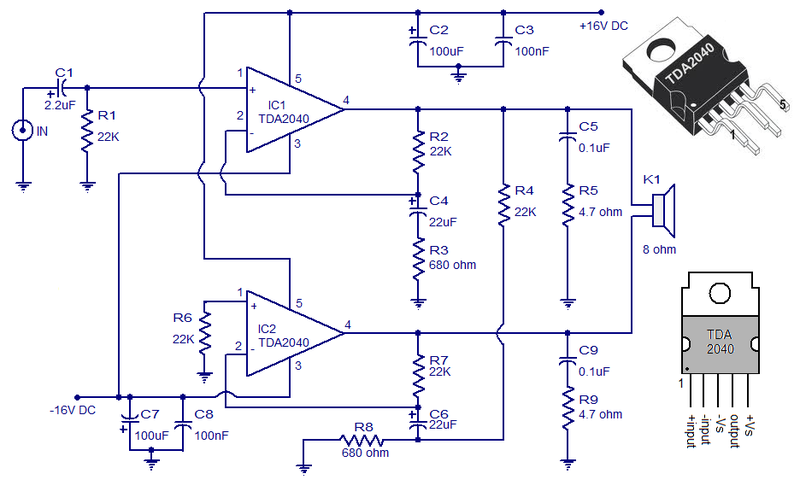 TDA2040 is class AB amplifier monolithic integrated audio Pentawatt available in the package. The IC has a low harmonic distortion, cross low over the distortion and has a built in short circuit protection circuit. 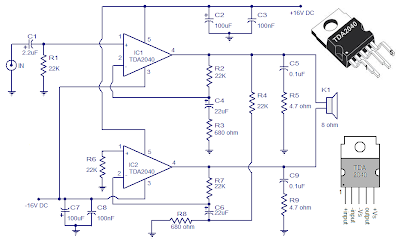 In the circuit of two TDA2040 ICs are connected in BTL (bridge tied load) configuration to provide an output of 30W into a 8 ohm speaker to + /-16V DC. Capacitor C1 is a decoupling capacitor DC input. Network consisting of components R2, C4, R3 provides information to IC1 as R7, C6, R8 network provides information of IC2. Red C5, C9 and R5, R9 provides high frequency stability. Capacitors C2, C3 filters positive power rail while the capacitors C7, C8 filters negative power rail.